Today, I’d like to let you all know what we did for Halloween here in the office. Unfortunately, Halloween has not been popular in Japan in the past, but it has been getting more and more popular recently. The most famous event would be the Halloween parade in Kawasaki, as well as some other costume parties in nightclubs in the city. People usually wear a costume and become their favorite characters, and can enjoy dancing and eating. Few people go to the neighbors and say “Trick or Treat!” like people in the US do – this is because many people still don’t know what Halloween is here. 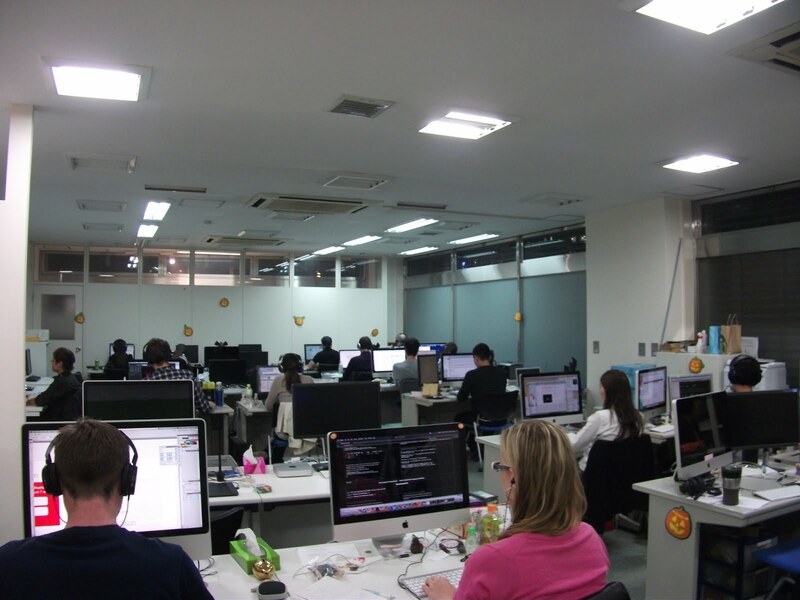 Since most of our team is from other countries, we decorated the office with Halloween stuff. Getting into the spirit, our boss Peter took the initiative with the decorations. 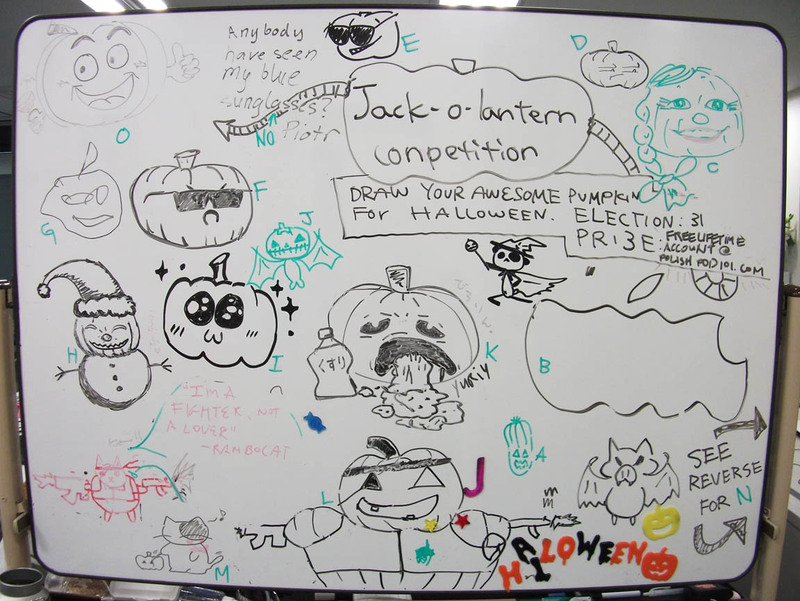 We also had another drawing competition, like we have for other occasions in the past. 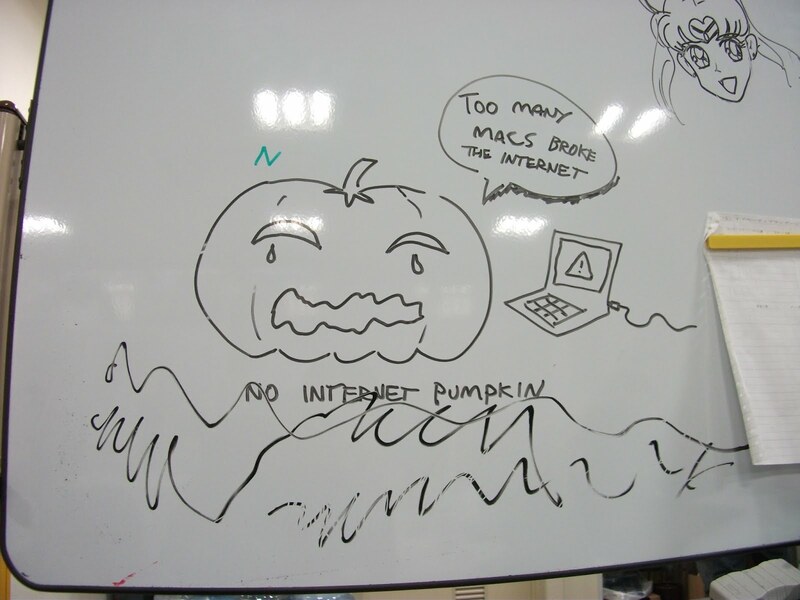 Our team members drew their own jack-o’-lanterns and then put them to a vote on the 31st. We had 2 in the first place. One is the ‘abstract’ interpretation on the top left (G) and the other one has big sparkly cute eyes (I). Which one do you like the most? What kind of jack-o’-lantern would you draw? Extra photo: Our new motto is “no sick days”! We work ourselves to the bone! Let’s play a game of Would You Rather? Over 300 language learning CDs (yeah, CDs…remember those?) piled to the ceiling in your bedroom next to stacks upon stacks of expensive, outdated textbooks that teach you dry, humorless conversation. The same amount of language learning content, shrunken down to fit onto your smartphone or tablet. And all those lessons? They’ve been updated to teach you vocabulary, grammar and culture so that learning language is actually fun! The answer is clear. You’d rather have Innovative Language Mobile! All on your tiny mobile device. Introducing Innovative Language Mobile Beta! Take all of your favorite language lessons and lesson notes on the go, anywhere you have a WiFi or 3G/4G connection, anytime and on any device. That’s thousands upon thousands of language lessons from our 27 language sites, available at the touch of a finger. Optimized for any screen, you’ll navigate through our rich collection of lessons and resources easily and intuitively. No more zooming. No more squinting. 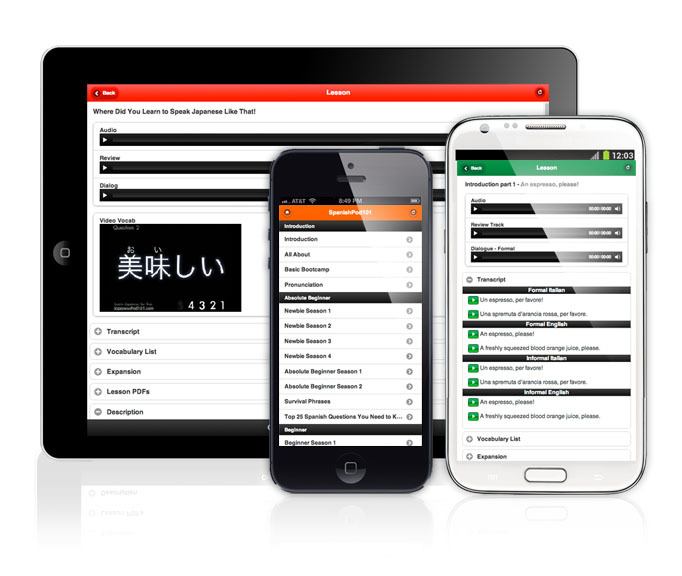 This is language learning on-the-go! Exclusive New Feature for 12-month and 24-month Premium Subscribers! Whether you’re an iOS or Android user, Beginner or Advanced speaker, you can swipe your way to fluency as you go from lesson to lesson. Accessed through your device’s browser, once you log in and your 12-month or 24-month Premium membership has been authenticated, you’ll gain access to our entire lesson library including audio, video, lesson notes, line-by-line transcripts and vocabulary with audio. Loading that many lessons onto your Phone would take up 20GB at least! With Innovative Language Mobile, you get all the content without giving up all that storage space. Save that extra space for more Instagram photos of your delicious lunch! Dialog Track – Hear just the Japanese-only dialog to make sure you understand it all! Innovative Language Mobile is currently available across all 27 language sites to 12-month and 24-month Premium and Premium Plus subscribers only. If you have questions or feedback for us, send us a message here.